The colder weather has gotten us busy getting our garden tractors “running good”. 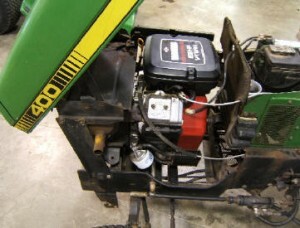 If you treasure your garden tractor, treat it to a new engine. Q: I have a Cub Cadet 1650 garden tractor and am interested in putting in your Vanguard 18 horsepower engine or larger. Your kit, will the original drive shaft bolt up to the kit and the motor mounts, will the engine utilize the same ISO mounts as the original or will a new mounting system be supplied? A: We usually take out the mounts and go solid to the frame. The Vanguard engines are so smooth they do not need the rubber mounts. There is more than one correct way to do the job and some of my customers mount on a rubber plate. Part of your original driveshaft will get reused. Also when you get this job done the tractor will almost feel like you have power steering after dropping 40 to 60 pounds off the front axle. Q: Jim, I have a Bolens Model H14XL garden tractor (1458). I believe it is a 1979 or 1980 model with a Techumseh OH140 14horsepower engine that I would like to repower. Would you know of an engine that would fit? A: Yes the 18 horsepower V-Twin Vanguard engine will take the place of that Tecumseh engine. The Vanguard engine also has an oil filter and oil pump and will fit right in that tractor. The Vanguard 18 horsepower actually puts out a short 20 horsepower. We also have the installation kits to get the job done. Q: My Onan P218 engine cratered the other day and I do not want to trash my John Deere 318 garden tractor. I would like a replacement engine that drops in with little modifications to the tractor. Please let me know what you recommend. I would like to do the repower in January while the weather is bad. A: We can set you right up and in my opinion this is the only way to go. The Vanguard V-Twin, overhead valve, 18 horsepower engine will fit right in and your side panels can go back on. It looks neater than factory when you get done. I also offer a very handy set up for you to do your installation. If you run into a problem just give me a call on my toll free number and I can talk you through any problem you might run into.